Watch Wednesday, February 25, 2015 at 6pm & 9pm on WORLD. 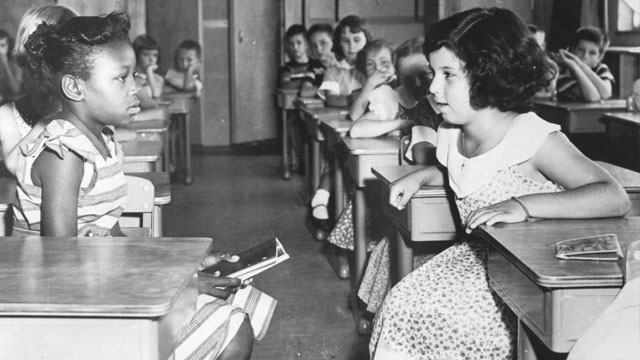 On May 17, 1954, the U.S. Supreme Court issued its ruling in the case of Brown vs. the Board of Education of Topeka, Kansas. This momentous Supreme Court decision focused national attention on the practice of maintaining racially segregated public schools. The documentary presents the stories of the individuals, events and circumstances that converged as the wheels of the legal system were set in motion.Black/White & Brown is narrated by Bill Kurtis and features readings by Walter Cronkite, Jim Lehrer and Bill Moyers.